Purse anthropology to discover the work of American designer and folk artist Enid Collins. 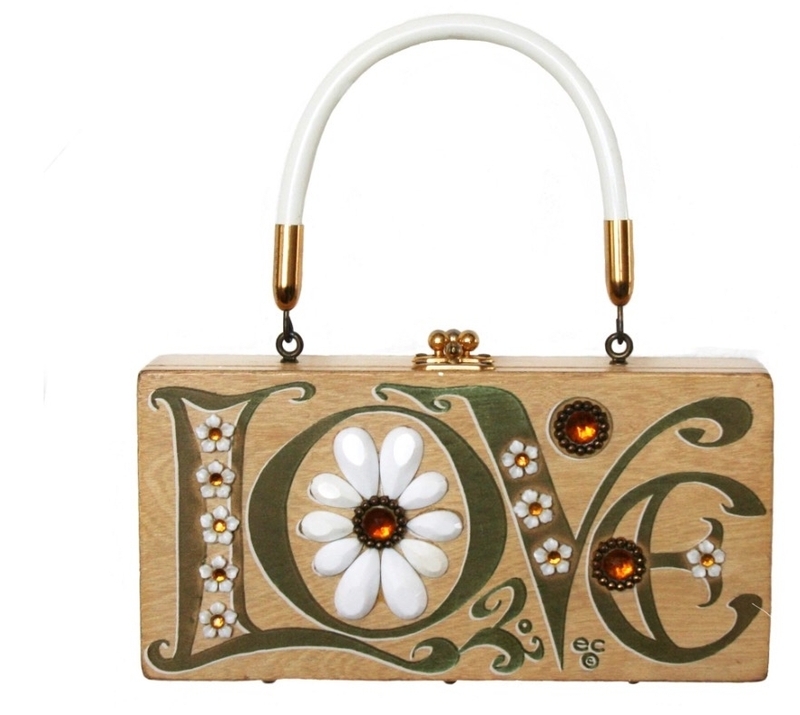 A personal and professional journey into the world of designer Enid Collins through her bejeweled box bags and other whimsical work. Anyone who has carried an Enid Collins bag knows it’s not just “a purse.” Likewise, finding enid with LOVE is not just a website. This is purse anthropology. Findingenidwithlove.com is the online hub of an anthropological project I began nine years ago, after my first serendipitous meeting with an Enid Collins “LOVE” box bag. Since then, what started as a relatively tame interest has become a fascinating adventure into all things Collinsiana. Today, my Enid Collins collection includes more than 400 original vintage box bags, dozens of canvas totes, bucket bags, papier maché jewelry and other work, as well as vintage advertising, catalogs and promotional materials. Guided by my professional background in cultural anthropology and art, the project has evolved into what I have dubbed “purse anthropology.” Through it, I seek to explore and build understanding about Enid Collins as an important American folk artist, designer, business woman and influential fashion-industry icon. I have also begun a curated museum-quality curation of Collins work, a collection I share along with highlights from my ongoing research in hopes of cultivating an online community devoted to Collinsiana. Your own Collins-bag memories and stories, collections and general Collins obsession can make valuable contributions to this project. Even shopping has a greater purpose: your purchase of Enid Collins bags and other items here supports curation of the collection and further research. Have a story or information that you'd like to share? Scroll down for more about how to participate. 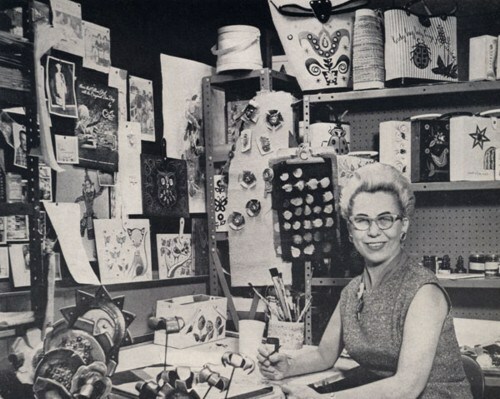 Enid Collins in her studio, 19??? Used with permission: ????? The Finding Enid with LOVE project includes development of a comprehensive digital archive to create a record of Enid Collins box bags, totes, jewelry and other works, as well as documents and histories. I research, recover, restore and catalog items according to professional anthropological methods. The online collection also includes my research, special exhibits, vintage advertising and promotional materials such as wholesale flyers, and more. Be part of the project: share your Enid Collins thoughts. I remember my first Enid Collins bag. I worked with Enid 20 years. Visit the museum gift shop to purchase vintage Enid Collins bags, authentic vintage jewels for restoration, and other fabulous fun stuff in the spirit of Enid.